Want to play a typography game that will make you crazy? 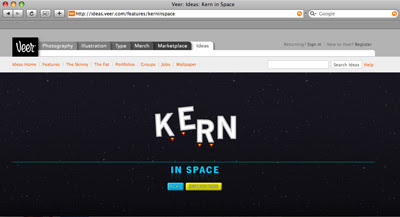 Try kerning in space at Veer. "On earth you kern with the best of them. But how well do your skills hold up in a fraction of earth's gravity? Check the gauges, fire the boosters, and do your best to give 80-point type a 3-point landing." Good luck, earthlings. It's super hard. That's too aggravating for me to play. Oh dear. Hard, but so addicting. Wow. I'm glad it's not that hard to kern in InDesign. it's impossible! i think i have it, but then the k explodes! What did poor Jerome ever do to you? Jess, do you have something against American musical theater? Mahan, as is often the case, I don't have the faintest idea what you're talking about. I got it after 3 tries. Not too terrible. I ran out of fuel on the second try when I was trying to place the R. Then I figured it out and got it lickety-split. Addicting! Never mind. Just rent Show Boat some time. Trust me.